Provide comfort for the family of "EJ" Engle with a meaningful gesture of sympathy. 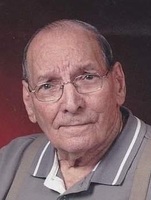 “EJ” Engle, 95 of Independence, MO passed away Tuesday, March 12, 2019. Services will be 10:00 a.m., Monday, March 18, 2019 at the Speaks Suburban Chapel, 18020 E. 39th St., Independence, MO 64055. Burial with full military honors will be in Mt. Washington Cemetery. The family will greet friends from 5 to 7:00 p.m., Sunday at the chapel. EJ was born September 13, 1923 in Kansas City, MO. He had proudly served in the US Army in the 82nd Airborne Division during WWII. He later worked for over 20 years as a machinist at the Lake City Ammunition Plant until he retired at the end of 1984. He enjoyed reading the entire newspaper, fishing, working in his yard, gardening and known to be very punctual. He was a member of the Blue Ridge Assembly of God Church. Survivors include; 7 grandchildren, Brad Buckley, Shayna Buckley, Jeff Engle, Sarah Grantham, Kyle Rustenhaven, Chelsea McMillin and Jayme Thornton; 13 great grandchildren; a daughter in law, Judy Engle; a son in law, James Thornton and special friends, Larry and Patti Cress. He was preceded in death by his wife, Betty June Engle, a son, John Engle, a daughter, Cheryl Thornton and a great grandchild, Summer Buckley. To send flowers in memory of "EJ" Engle, please visit our Heartfelt Sympathies Store. Consider providing a gift of comfort for the family of "EJ" Engle by sending flowers. We encourage you to share your most beloved memories of "EJ" here, so that the family and other loved ones can always see it. You can upload cherished photographs, or share your favorite stories, and can even comment on those shared by others. Plant a Tree in Memory of "EJ"